Acknowledged author Janice J. Thompson wrote The Science of Nutrition (4th Edition) comprising 976 pages back in 2016. Textbook and etextbook are published under ISBN 0134175093 and 9780134175096. 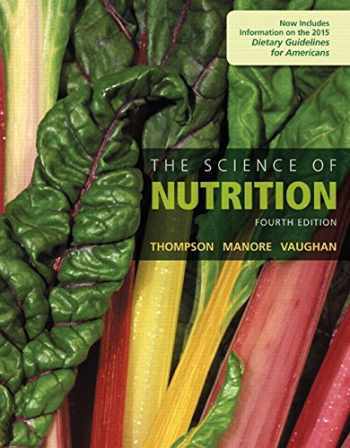 Since then The Science of Nutrition (4th Edition) textbook received total rating of 3.5 stars and was available to sell back to BooksRun online for the top buyback price of $60.91 or rent at the marketplace. For introductory Nutrition courses for Majors. Helping students navigate nutrition’s tough topics for a deeper understanding The Science of Nutrition offers the best combination of text and media to help students master the toughest nutrition concepts in the course, while providing the richest support to save instructors’ time. This best selling, thoroughly current, research-based nutrition text is uniquely organized around the highly regarded functional approach, which organizes vitamins and minerals based on their functions within the body and is easily seen in the organization of the micronutrient (vitamin and mineral) chapters. The 4th Edition enhances the student learning story with greater incorporation of learning outcomes throughout the text; an increased visual impact with the inclusion of new Focus Figures, including Meal Focus Figures; and a strong media story with new assets in Mastering Nutrition, including revised nutrition animations. Important hot topics and new research such as the latest dietary guidelines and Nutrition Facts panel, a revised global hunger chapter (to incorporate more coverage of domestic issues, including sustainability and environmental impacts, food equity, politics, etc. ), and updated science and source information make this one of the most current texts on the market today. Also available with Mastering Nutrition This title is also available with Mastering™ Nutrition--an online homework, tutorial, and assessment program designed to work with this text to engage students and improve results. Interactive, self-paced tutorials provide individualized coaching to help students stay on track. With a wide range of activities available, students can actively learn, understand, and retain even the most difficult concepts. Note : You are purchasing a standalone product; Mastering Nutrition does not come packaged with this content. MyLab is not a self-paced technology and should only be purchased when required by an instructor. Students, if interested in purchasing this title with Mastering Nutrition, ask your instructor for the correct package ISBN and Course ID. Instructors, contact your Pearson representative for more information. If you would like to purchase both the physical text and Mastering Nutrition, search for: 0134166000 / 9780134166001 The Science of Nutrition plus Mastering Nutrition with MyDietAnalysis with Pearson eText -- Access Card Package Package consists of: 0134175093 / 9780134175096 Science of Nutrition, The 0134323122 / 9780134323121 Mastering Nutrition with MyDietAnalysis with Pearson eText -- ValuePack Access Card -- for The Science of Nutrition The Science of Nutrition , 4th Edition is also available via Pearson eText, a simple-to-use, mobile, personalized reading experience that lets instructors connect with and motivate students — right in their eTextbook. Learn more.